It’s simple. We are not as aware as we should be about the prevalence of traumatic brain injuries (TBIs). You may think that because your child doesn’t play football, they are not at risk. Maybe you see yourself as a careful driver so getting in an accident that could cause a TBI is unlikely. You may think that, because of your age, you are not active anymore and are not at risk. These are all dangerous misconceptions. If you are unconvinced, here are five statistics that shed light on the life-altering nature of TBIs. 329,000 children (age 19 and younger) required hospital treatment for sports and recreation-related brain injuries. Children can experience concussions outside of football, even organized sports in general. Your child can receive a concussion by falling off a bike or hitting their head. Make sure their coaches are following safety measures. Understand that small blows and hits also cause injury. Keep an eye out. Encourage your children to report symptoms or when they aren’t feeling well. A TBI can be caused by a wide variety of scenarios—a fall, a blow to the head, combat, vehicle accidents, recreational sports, and more. 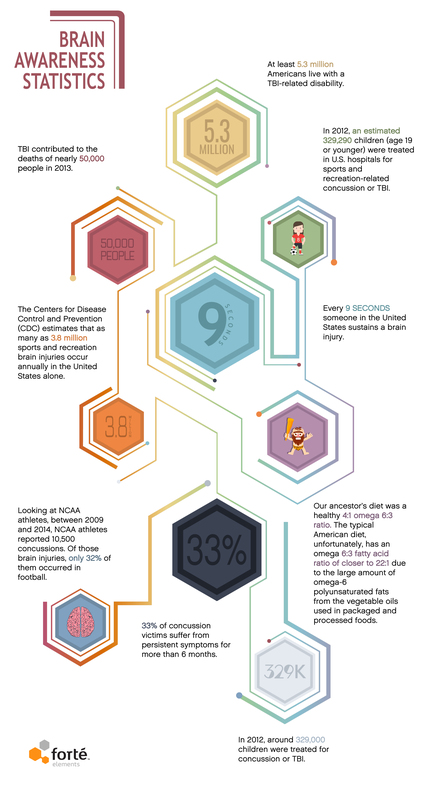 Unfortunately, these brain injuries often cause long-lasting effects and disabilities. Here are a few disabilities that people live with. Post-concussion syndrome. This typically occurs within a few days after the initial injury and causes dizziness, headaches, and concentration, sleep, and memory problems. Sensory problems. This can involve a ringing in the ears, tingling or skin irritation, or bad tastes in the mouth. Emotional trauma. Examples of emotional difficulties are anxiety, depression, anger or irritability, and mood swings. In some cases, these issues can evolve into violence and extreme aggression. Communication disabilities. Speech changes or difficulties are common for TBI patients. These changes may include inability to speak or understand language, slurred speech, or even difficulty reading verbal cues and body language. There are 86,400 seconds in a day. That means that every day there are around 9,600 brain injuries and over 3 million every year in the United States. The brain is the powerhouse of our bodies. It controls all your organs and everything you do. It is complex and intricate. And if injured, it can have serious consequences. In fact, head/brain injury is one of the leading causes of death in the modern world8. Studies have shown that 33% of concussion victims suffer from persistent symptoms for more than 6 months while 15% report symptoms for up to 12 months following injury. Such symptoms show that a concussion or any type of TBI is more than just a bump on the head. Symptoms may include dizziness, headache, speech difficulty, poor balance, sleep trouble, depression or anxiety, and sensory problems like sensitivity to light or ringing ears.